Factory Wheels and Tires for sale east of Dallas Texas outside Point Texas. We stock sets of Chevrolet, Ford, Dodge, Jeep and Toyota oem wheels and tires for Silverado, Tahoe, Yukon, Suburban, Denali, Chevy 1500, Chevy 2500 and Chevy 3500 include dually wheels and tire sets. 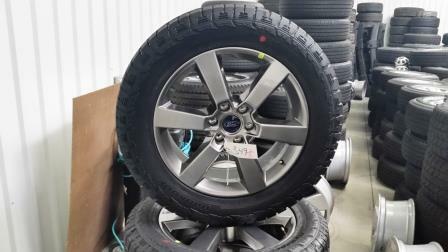 We have a number of Ford F150, F250, F350 Dually, Explorer and Expedition oem wheels and tires in stock. Sets of Jeep Wrangler, Sahara and Rubicon oem wheel and tire sets in stock. Factory wheels tire sets like new featuring Chevrolet, Ford, Dodge, Jeep, Toyota and a few other brand of pickup, SUV and car factory wheels and tire sets. We stock over 150 sets of Silverado, F150, F250, F250, Dually, Jeep Wrangler, Tahoe, Suburban, Denali, Avalanche and other leading models. Our Factory Wheels Tires sets never will come with TPMS sensors or lug nuts. Tire pressure sensors are available from aftermarket suppliers. Either purchase from auto part stores or online from sites like Auto Zone. Most tire shops carry them and can program them for you. These sensors are removed before we ever get the wheels and there is no way to predict what vehicle you will put them on or the year. (2014 and 2015 models) including BFG Mud tires on Jeep Wrangler Rubicon wheels. 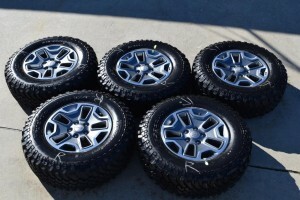 Set of FIVE (5) steel jeep wheels and goodyear tires on sale. Dodge OEM Wheels including Dodge Ram 1500 and Ram 2500 OEM wheels and tires. What Are Dealer Take Off Wheels and Tires? Factory Wheels and tires are OEM, not replicas or fakes. These are usually dealership take offs which mean the person buying the vehicle, or the dealership itself, sends the vehicle before purchase to an accessory shop. They add aftermarket wheels, tires, lift kits, grills and headlights on a pickup or car. OEM wheels and tires are highly desirable because of their high original quality and resell values. Purchases of factory wheels and tires are usually individuals, body shops and insurance companies. Prices at a dealership can reach over $4,000 for a set of new tires and wheels. A take off set can run you up to 75% less results in thousands of dollars in savings.